A girl and an artist from a family of non-believers in Leningrad was looking for herself for a long time. Punk rock, hippies, rock music, tourism and even extrasensorics... Today she is an abbess of a convent. She is also an icon painter, architect and a builder. Hegumenia Daniila (Myasnikova), Abbess of the convent dedicated to the Albazin Icon of the Theotokos in the Amur region, gave an interview about monastic life and daily routine, faith “through rose-colored spectacles”, and more. Abbot Ephraim of Vatopedi: When the Elder Told Me I’d Become a Monk, I Thought: What a Nightmare! As a young girl, she had an ordinary life in St. Petersburg: she had an typical Soviet family, was skilled at drawing and entered the Department of Design at an art school. Then she started looking for the meaning of life in rock music, the hippy movement, tourism, even famous Petersburg punk rockers, and … Orthodox Christianity. The abbess remembers the beginning of her Orthodox life with a smile. There was no Internet and she did not have good literature and was scared to come to a priest. So, the main source of information, became elderly ladies in a church, who freely shared necessary knowledge and church folk literature with the callow youth. Hegumenia Daniila pointed out that it was difficult to distinguish truth from superstition, however, she did learn somehow “how to light a candle for something, to cross herself, go to confessioon, and to take Holy Communion”. Having accidentally found out about the institution of spiritual fathers, she started to look for such a father and for a parish which could become her own. After her search in the churches in St. Petersburg, she found a recently opened church in honor of the Holy Martyrs Faith, Hope and Love and Their Mother Sophia. 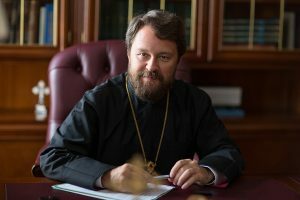 The rector of the church was Hieromonk Lukian, who is now Bishop Lukian (Kutsenko) of Blagoveshchensk and Tynda. 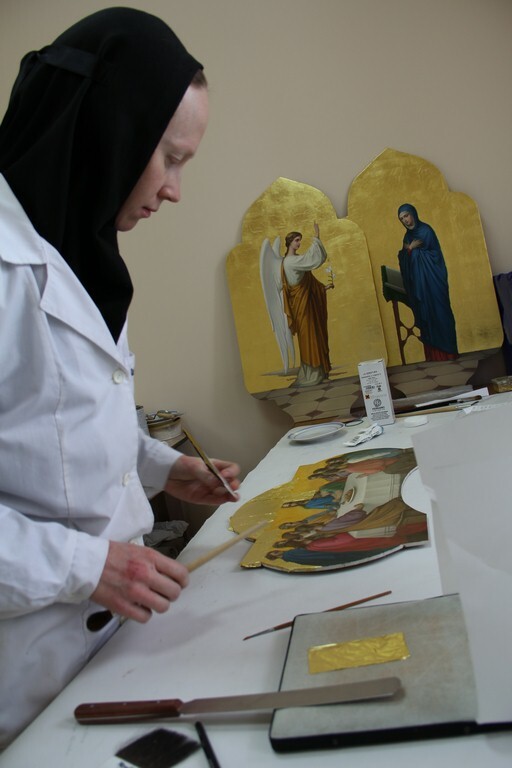 First icons for the church were drawn by an amateur artist from Odessa, which must each be brought from the city. Then, the rector decided to open a studio. He gave photos of icons to Orthodox young people who could draw and asked them to copy them. The new activity was difficult for Mother Daniila, who could not imagine herself becoming a teacher of church painting thousands kilometers away from her native city. Back then, a chapel was needed on the premises of the Protection Veil Convent in Tervenichi, which was being restored. The parish could not afford the fees local architects requested, so, Father Lukian blessed his spiritual children to try to design the project. The project was finished in two days, which, of course, had to be later corrected during construction, but it was successful. Mother Daniila started to study architecture. After twenty years, the Protection Convent in Tervenichi was finished due to the efforts of two people with no formal education in architecture. Today, Mother Daniila is the Abbess of the convent dedicated to the Albazin Icon of the Holy Theotokos in the Amur region. She spends her time working just as she was taught by Father Lukian. She chooses lumber, paint, coal and anything which is needed for the new convent by herself. Don’t people go to monasteries for private devotion? —How did a young beautiful and talented woman end up living in a convent? —At first, I looked for the meaning of life and then for the form of this life. There were two equivalent paths: either family or monasticism. The monastic path seemed completely incomprehensible. There was no visible example of what it all meant until my acquaintance with Vladyka, Hieromonk Lukian back then. Later I met some nuns, with whom I had a chance to communicate intimately and very often. Back then I devoted all my free time to journeys to the convent. Then I felt that it was my thing at some point. Back then I already understood that monastic people were not saints and they were merely trying to become like one. One faces human weaknesses more closely in a monastery compared to ordinary secular life. However, I was drawn to the taste of monastic life, when everything is laid down at the feet of the Savior. At some point, I understood that I wanted precisely that path. —Does it mean that your spiritual father showed you the monastic path? —A normal competent spiritual father will never put pressure on anyone. One’s personality is very easy to break, especially if it is of a beginner in Christianity. People usually say they preserve their freedom and independence, whereas in fact they often look for someone to give their freedom to and for a babysitter who would prescribe every step: right or left, that way or another, buy a fridge or a television. —Doesn’t a nun have the problem of choice? —Of course, she does. Unfortunately, one has to think for oneself even under the vow of obedience. At first, I also supported the idea of having a spiritual father and closely following his commands. I understood obedience in a way that there is one who is responsible for everything and you are just a blind performer. So it is all the babysitter’s fault, I am innocent, but you should just take me to the Kingdom of Heaven! Then it turned out that one should make one’s own steps toward the Kingdom of Heaven. 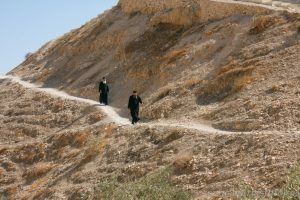 A spiritual father can merely help a person with their choice – he might see a potential family man or a loner whose path is to serve Christ leading a monastic life. —So did your spiritual father only point to this path? —Vladyka Lukian never puts pressure on anyone, but he also doesn’t allow one to spend their time idly: “Look for your thing. Do not waste time. Go forward.” There has always been this kind of pressure. One could not relax back then, nor now. So after that, you think for yourself and decide what it is that you want. He offered examples and always told us about people he had met in his life. He was the one who spoke with spiritual children of saints, who have already been canonized by the Orthodox Church. —There is a New Martyr, Father Pavel Gaydar. His closest spiritual daughter, Paraskeva Zakharchenko, followed him on his entire path. Her father brought her to Father Pavel when she was a girl. She became his first helper. She followed Father Pavel in all of his deportations. She was a confessor and went through a lot. Our Vladyka was her spiritual son. He also came to her when he was a boy. His church life began with his communication with that woman. 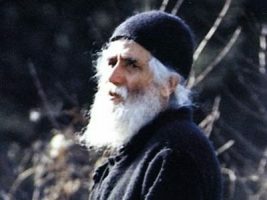 His second spiritual mentor was Nun Leonida, who was a spiritual daughter of the Righteous Elder Ivan Petrovich Zhukovsky, who lived in Odessa in the 1950s and performed the hardest deed of our time – foolishness for Christ. Currently the canonization of this elder is being organized. —You come from a sacred place where Orthodox Christianity had been established firmly, long before the Bolsheviks started to eradicate it. Here, however, the settlement began at the second half of the 19th century and so faith in Christ has not naturalized yet. What is it like to be here? —Spiritual foundation was very powerful there, that is for sure, but that foundation had been destroyed long before the Revolution began. There were few truly religous people before the times of impious persecution. The upper class in the imperial Russia, when it was supposedly Orthodox, were already far from Orthodox Christianity. Orthodoxy existed thanks to a very few saints. Perhaps, if there had been more saints, the Revolution would not have broken out. In the nineties, the situation in St. Petersburg was almost the same as here in the Amur region. It was as if we had gone 20 years back. Spiritual foundation, churches and holy things do not save people automatically. Certainly, everyone knows well that festive divine services, religious processions, and candles lit for health or repose are good and essential. But Orthodoxy is hard work in everyday life. Even mature Christians seem to have difficulties in their church life getting through potholes, sins and doubts. Fortunately, the root of the Orthodox Church is much deeper than even the greatest holy places. The Church was founded by Christ Himself and has the strength to grow through any “asphalt”. The Amur land has its own unique value. It is true that the Orthodox tradition here is not so strong as it is in the “western part” of the country, but there is much more unspoiled, innocent, and original purity. —What does faith through rose-colored spectacles mean? —A very large number of people suddenly started to attend Orthodox churches in the nineties. Many of them were not ready to follow Christ. They accepted strict limits such as no drugs, no smoking, no fornication, no stealing, and no swearing, but did not find it to be appealing for long. Quickly this large number of people stopped going to churches and went astray. It happened according to the Gospel really: they exorcized one spirit, but seven entered instead. Even some of those who tried to accept a monastic lifestyle later abandoned it and completely lost their faith for the same reason. This process has just begun in our region. —Does it mean it is possible to prevent this and avoid mistakes? How, though, can one distinguish truly church life when one follows Christ from the life of merely conducting rituals and rites, in other words, some external aspects? —Everyone gets through this. It is a long and difficult process. Almost every person whom I lived with in the convent and I had doubts about this. Is my path right or not? Who will tell me if it is true or false? People nowadays say though that there are no elders left, does it mean that there cannot be salvation? People say that the time of the end has come and that there are neither true monasteries nor monks. Eventually, one understands that the Lord brings each person to this world now at a unique period of time. Thus, people are placed in a situation similar to a student’s who does not have an opportunity to do their test copying the works of the 16th, 4th, or the 1st centuries so that they have to do it on their own. They can use those works and base their answer on them, but still do the test by themselves. One has to think for oneself and to act accordingly even living under a vow of obedience in a convent. Vladyka, whom a very large number of people consider to be their spiritual father, has never allowed anyone to treat him like a babysitter. One can receive his answers to some questions, but only if those are the most important and global. Therefore one is facing the circumstances by oneself and should decide what is right to do by oneself. A hint for you here: you know the Gospel, the Lord’s Commandments, you have conscience and brains, so you should decide for yourself. —Then what does obedience mean in general? It is written in books that there is no you and you do not have will. How are people supposed to get closer to God if they do not have their own will, but still have to do it on their own? —The Holy Fathers said that spiritual work is science of all sciences for a reason. It is a path of following the Lord’s Commandments, and obedience is a tool to do it. Spiritual life is the ability to stand at the only angle which will prevent a person from falling. One can fall at all 360 degrees: right, left, forward, and backward, but there is only one angle at which one can keep one’s balance. The aim of every person is to find this angle. Take any commandment for example, and there are right and left sides for falling. The Holy Fathers doubted how to define obedience and said it was school. One trains to listen to the voice of one’s spiritual father, to such voice from the outside, not one’s own principles and ideas about what is right. Acquiring the skill to hear what another person says, helps to hear God. Then He will tell you where to go and He will direct you. In a monastery you accept limits and you have a certain superior. Technically, a secular person also has a superior in their family or at work, therefore, everyone faces obedience when they either do what they believe to be right, or do what is actually right. —A superior can be wrong in the secular world, or sometimes we just think they are. Is it the same in a convent? —So how are we supposed to obey him or her? —The Gospel has the instructions. Any arranged authority is from God. Husband is the head of his wife in the family, either he is right or wrong. Very often a superior seems to be wrong, but you obey them for God’s sake, and suddenly, situation changes completely and it turns out that it was the only right thing to do. Sometimes you obey this wrong superior and next day you think and cannot understand what the fuss was all about. You sacrificed a trifle, but preserved peace. There is a hierarchy of values here as well and wrongness can be different. —Do you mean that the one who did not obey is wrong? —There have been heretics among hierarchs and great sinners among superiors of monasteries in the history of the Church. It happens. There are many situations which saints went through as well. Why should people read the Lives of the Saints? It is a source of life experience. So many venerable saints have gone through persecution in monasteries! Their own brotherhood mocked them, and the superior did as well – being a feeble and sinful person. He may not like something about this show-off: everyone is normal, but this one is a saint, you see, he fasts and prays not like everyone, and has the nerve to do miracles! Why can’t we do the same? Thus, strained relationships begin. How did the saints handle this situation? They obeyed meekly and were ready to lay down their lives for obedience. —Does it mean that one cannot escape earthly contradiction in a monastery anyway? What is the difference then? —A monk is a potential opportunity of being in a closer contact with God, when nothing disturbs one, and when one does not have to be in a communication with anyone else. Monks have communication with people, but it is not as intimately deep as it unavoidably is in a married life. Whatever the situation in a monastery is, this depth stays untouched. —You are a hegumenia, and it is arduous work. So you were taken out of a natural environment for a nun, when it is just “God and I”. You have to do more earthly activities than an average secular person. Is it still monasticism? —It is monasticism too. Monasticism is serving Christ under the conditions which exist at a certain moment. A normal life in a monastery is when a person has a certain schedule for a day, which is normal and human. It means there is an opportunity not to think about everyday problems such as what you will eat tomorrow or what you will wear. There is a person who thinks how to provide the entire monastery with food and clothing. When responsibilities are clearly divided, it allows one to take care of oneself and do one’s activities in a monastery without having unwanted thoughts. A monk is supposed to have a place where he can seclude himself and just stay with God, angels, and saints in private. It is ideal. Currently, it is essential to do everything so that people capable of leading a monastic life would have such an opportunity. Certainly, I would like to live in such a hothouse now. However, the Lord always puts one in a place where He thinks is necessary, whatever one’s aspirations are. I am currently doing what is necessary: I run around the city looking for cement, lumber, paint, and for someone who can give me coal for the boiler room. This is my current obedience. —Aren’t there any monks who can do this un-womanly task? —Our convent is for women and we have our own economy. The thing is that one understands at a certain moment that whatever lifestyle one leads, spiritual life is not about living in hothouse conditions. It is God’s gift to understand this. At first, everyone thinks that a monastery is, as one woman called it, “the life of a plant”. In other words, monks live in the way cows graze peacefully, while the grass is green and birds sing. Monks do not sow and reap the harvest and the Lord feeds and dresses them. Actually, He feeds and dresses them, but also makes them work. Gradually, one starts to understand that a monastic life and one’s cell are in one’s heart. One understands the meaning of the words “the Kingdom of Heaven is within you”. Why did the saints, who were put in concentration camps at the beginning of the 20th century, stay holy among the most confirmed criminals? When one reads their letters from penal institutions, one is surprised at their inner peace and inner calm! People managed to see God in a cell, in dirt, where people swore, mocked and tortured. The saints were with God. Fortunately, our today’s tasks are immeasurably easier. —What is your personal goal at the present time? —My personal goal is to create hothouse conditions for our mothers and for future nuns who will enter our convent. —How are you reaching this goal? —There are seventeen mothers in our convent, which is two years old. The main achievement for this time is the opening of a church. Starting from November, 2014, regular divine services are held in the church and our convent began to live and breathe. Common monastic prayer and Divine Liturgies started to take place. The most valuable things in a convent: monastic group and family – are being developed. People have already started to get used to each other, breaking their thorns. We already have key people in the convent who will be able to explain something to newcomers. —Where do newcomers come from? A convent is a new thing for the Amur region. Until recently, there has been only a monastery somewhere in Tynda. —They come in the same way people came in every century. People were not born as monks. They simply met God at some point of their lives, suddenly realized that God exists and that they lived inside His world. It is hard to describe it with words. A person simply understood that they wanted to be with Him and to obey Him. —Say someone reads this and suddenly realizes that God is within them, so that they will aspire to obey Him. Say a whole “army” of such people suddenly comes to your convent. How do you distinguish those who actually were brought by God from those who are “cows on an idyllic glade”? —By trial and error. Sometime ago, this is how the Protection Convent in Tervenichi was founded. 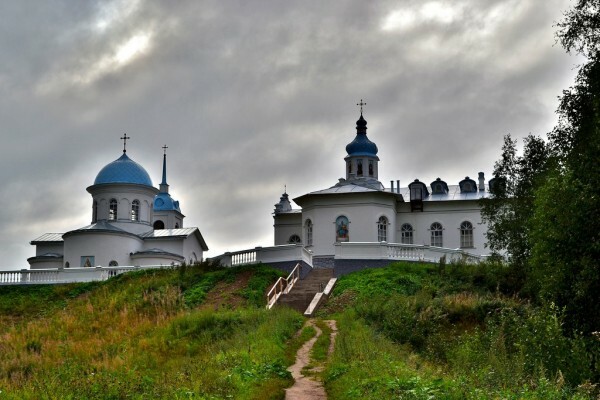 Two retired women, who left everything they had gained by their hard and honest work, followed a twenty-five-year-old hieromonk to the backwoods: to a destroyed village, which was more like an empty place. It was in order to live in a shed, carry water, chop wood living in hunger. Then people started to come there. Some stayed, and still live there happily for many years now. Some did not withstand withdrawal symptoms when they realized that a convent was completely different from what they imagined, saw in movies, or read in books. Some survived earthly illnesses and stayed in the convent, but some people left, after they realized their wishes, and built a family in the world, which is also good. Certainly, there were people who left more tragically – in conflict. —How many nuns and novices should be in your convent? Do you plan the number or is it determined gradually by itself? —It is determined by itself. There are times when a very large number of people enter a monastery: a new strong candidate appears literally each month. Then the flow stops. No one comes for a couple of years. After this quiet period, people come again. I do not know what the reason is. God decides how many people should be in a convent. —Do earthly difficulties affect the statistics of the flow of people in a convent? For example, the current crisis? —The Lord reproves people in different ways. Some people are taught through illness and some through economic difficulties. People deal with difficulties in a different way. Some break, but some become stronger. —There are such people, but they usually don’t stay long. Calling is essential for a monastery. Sometimes it is more difficult in a monastery. One cannot become a musician, because he was a bad physicist – one needs an ear for music. —Lumber is part of the creative process. What can I do? I would like to spend time in front of an easel, of course. But you understand that you will need to buy this easel and find money for it. You will need to find paints somewhere and somehow beautify a room for drawing. Anyway, someone has to do this and you can do this better than anyone, because you would do this for yourself. A convent will not grow by itself. Do you want to enter a convent? Do you want to make it the best? Who will make it such? I will! —How do you survive while there is an empty place instead of a convent? How did you manage to survive it here in the beginning? —Thanks to God’s help and wonderful Amur residents. When we arrived there was indeed nothing. The diocese took care of the restoration of the convent. We are still obliged to it. 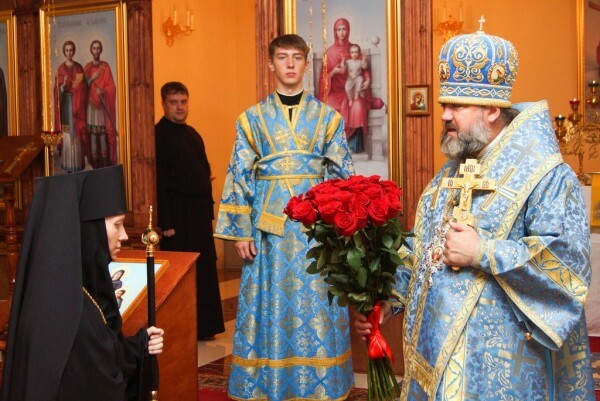 A female benefactor helped to transform a half-destroyed rock club into a church in honor of the Holy Martyrs Faith, Hope and Love in Blagoveshchensk. We wait for exterior repair, but inside it is a complete church. A person just sacrificed something and gave it to the Church. Another female parishioner presented the convent with an automobile. A congregation started to gather, people started to attend divine services. They helped to buy implements and to clean the church after the repairs. One would think the situation was hopeless, there were not enough means. One elderly woman donated a kopek, another and another… Thus, we saved enough to buy a car of coal and were able to heat the convent for a week. Monasteries and churches have always been built by the whole world. —How can one participate in such help? For example, if a person is on vacation and wants to serve. —People call me or reach me through our metochion in Blagoveshchensk. Currently, we have an opportunity to accept several people. The convent provides food. At the moment, we accept only those who are ready to serve. In the future, I want to give people an opportunity to escape the city, to give their souls some rest, to walk around, to pray, and to live in a convent for some reasonable donation according to one’s circumstances. If you brought three rubles to a church, you will already consider it your home. People do not value things they get for free. When it is gained by hard work, it becomes a favorite church or a favorite convent. Some people come to the Church thanks to this: they felt sorry for nuns who were cold, gave a kopek and then they found out it was appealing — it was life.